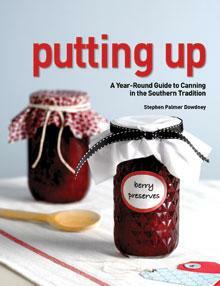 Whether you're a novice at canning or more experienced, you'll get something from this book. Right off the bat there's a disclaimer saying that "home-canned products may cause serious harm if put up improperly", and that "every recipe in this book must be carefully read, and the instructions followed accordingly". That said, who'd want to start canning anyway! Many, many people can all the time, and safely, so as long as you follow the basic rules of "putting up" (cleanliness and acidity levels), you should be fine. Dowdney offers very interesting and helpful advice under his Canning chapter that will make things so much easier for you if you read them ahead of time. He covers everything from what you'll need (not much) to the procedures (very achievable) of canning properly and safely. His book is divided into months and the foods that are available in the South Carolina Lowcountry. He says you can happily use store-bought produce if not available at farm stalls near you. Foods canned include garlic, artichokes, strawberries, asparagus, beets, tomatoes, cucumbers, berries, shrimp, beans, peaches, peppers, figs, okra, watermelon, pears, pumpkin, sweet potato, and peas. He makes relishes, pickles, chow-chow, preserves, chutney, salsa, soups, jellies, marmalade and butter. I don't eat much canned foods but I do love the little labels and cloth caps on the jars. So homey. I appreciate Dowdney's section on pots (pages 28 and 30) whether you're canning or not. Good to know information. Conclusion - A few recipes along with a huge amount of pertinent info on canning. Very interesting.